I was lucky enough to have 9 shortlisted entries, although it’s fair to say that it wasn’t a particularly short list at all! One of the great things about the OPOTY competition is that they display all the shortlisted entries on the site. Each category must’ve had around 300 – 400 entries shortlisted and so there was still a long way to go. I had 3 images shortlisted in each of 3 categories – At The Waters Edge, Light on the Land, and Wildlife in Sight. From these only 1 made it through to the final round of judging, so I’m very pleased that it made it into the book. This year there were over 17,000 entries in total, and after having been shortlisted in the previous 2 years competition without success, I’m very chuffed to have made it through this time. 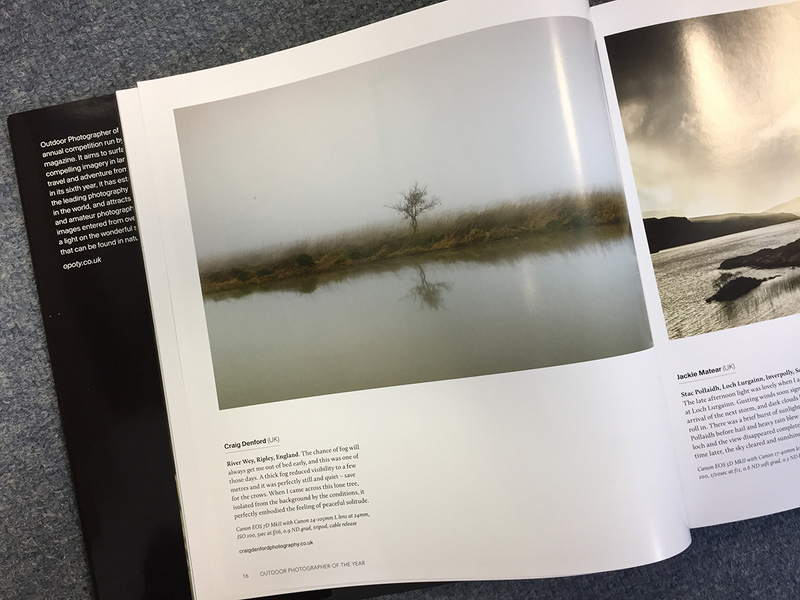 The full list of winning and commended entries was published back in mid January, so it’s been an agonisingly long two month wait to finally see my photograph in the book. The shot was taken back in March of last year on a wonderfully foggy morning. I had gone to Ripley before work to photograph Newark Priory, but the fog was so thick that the ruins were completely obscured. Undeterred I decided to take a walk down the River Wey, and that’s when I stumbled across this lone little tree and a perfectly still river. A real eureka moment, and testament to keeping an open mind when Plan A doesn’t work out. It’s often the ‘surprise shots’ you get when you head out that prove the most fruitful. The book can be ordered through the website here.